Lapdog Mama's got a brand new bag... and I heart it! I received the Dog Tote Bag from Simply Bags, makers of embroidered tote bags, for review a couple of weeks ago. The Dog Tote makes a great, well... doggy bag. Use it to hold all of your pooch's essentials - leash, water bottle, food, favorite toy, treats, etc. It makes a great day trip bag whether you're headed off for a fun afternoon at the dog park or for an overnight stay at Grandma's house. Of course, the Dog Tote also makes a great everyday bag for doggy Mamas! It's great for toting around craft, school or work items (yes, it will hold file folders with ease). Mine will pull double duty, but more than likely be used more for toting human items. It's the perfect size for an adventure that must include knitting, a magazine and my nook, plus it can still fit water, toys and some treats (for both human and K9). 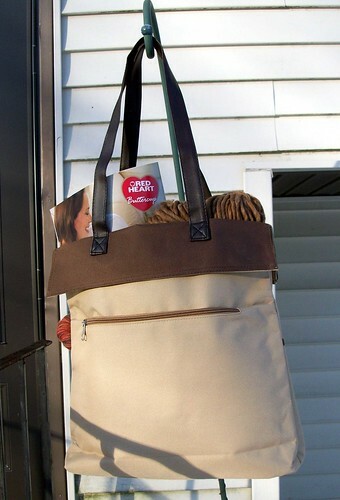 The Dog Tote is one of those perfect sized bags - not too big, not too small - and it hangs nicely over your shoulder, or you can carry it by the handles. Made of lightweight water repllent fabric, the tote measures 14" wide x 14" tall x 3" deep. Besides the roomy main compartment, there are two outside pockets on the front and one zippered pocket on the back. A clear slot on the bottom left-hand corner holds a 3.5" x 5" photo of your furry friend. One of my favorite sayings, "Dogs leave pawprints on your Heart," is embroidered on the front, plus you get your pooch's name across the top at no extra charge. Since there's no way Mama could pick just one Lapdog, I opted to go the human name route. I love everything about this bag - the neutral colors, the saying, the photo slot, the cute puppy silhouette.... and especially the seemingly easy to care for material. It has already been slobbered on by at least two Lapdogs (Lola, the queen licker, must taste everything) and it wiped clean with a damp towel in seconds. 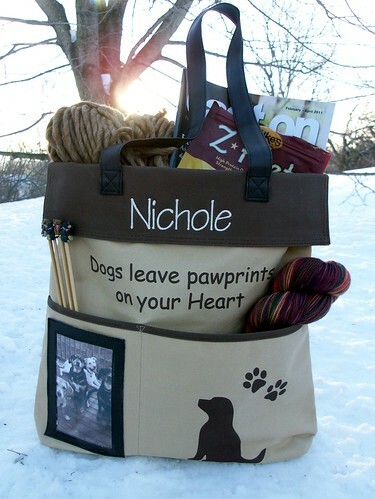 If you're in the market for a new bag or need a solution for organizing you dog's items, check out the Dog Tote! What a wonderful bag. If we weren't cats, HH would want one of those for sure. Somehow the mom here is going to get one of those - I love that tote and it would be ideal for when me and Shiloh or Shasta go visiting (they are both therapy dogs) or when I take Shiloh to the library where the kids read to him (he's also a Reading Education Assistance Dog). I love that you can personalize it and you can add a picture too.